TORONTO, ON--(Marketwired - September 22, 2016) - Visa Canada and Toronto Public Library announced today they are teaming up to offer financial literacy education to Toronto's youth, beginning with the distribution of a new educational comic book that teaches readers of all ages about personal finance. Created by Marvel Custom Solutions, the new comic, Guardians of the Galaxy: Rocket's Powerful Plan, combines Marvel's iconic Super Heroes with Visa's financial literacy expertise to introduce readers to fundamental money management concepts. Toronto Public Library, the busiest urban public library system in the world, will make copies of the new Marvel comic book available free at 100 branches across the city. "At Visa we believe that financial education can be incredibly effective when the public and private sectors work together," said Carla Hindman, Head of Financial Education, Visa Canada. 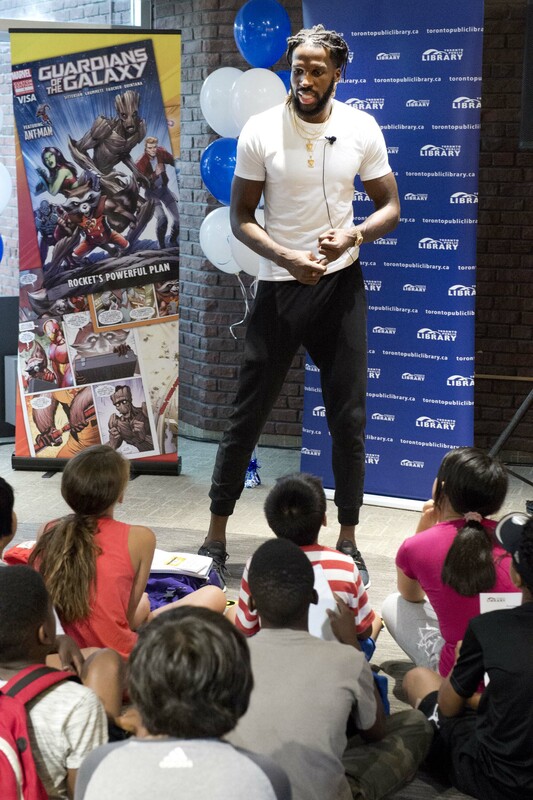 "We're thrilled to join forces with Toronto Public Library to share our new Marvel comic book and other financial education resources with young people across Toronto." "We are excited to partner with Visa to help build the financial education of our young people. Starting with this comic, we are hoping to show our youth population that personal finance can be fun," said Lisa Heggum, Child & Youth Advocate at Toronto Public Library. "We are proud to offer a tool that gives young people a head start on making sound financial decisions." Guardians of the Galaxy: Rocket's Powerful Plan is available through Practical Money Skills, a free financial education program that has been operating in Canada by Visa since 1996. Visa's support of the Toronto Public Library's financial education efforts will continue with events and activities scheduled to take place in February 2017, when the Library focuses their youth programming on financial literacy. "Working on this comic was a unique opportunity that enabled us to introduce core concepts about finance and savings using the Guardians of the Galaxy and Ant-Man in a fun, action-packed story," said Darren Sanchez, Marvel Custom Solutions Editor. The new comic book will be released around the world in 16 languages. This is the second time Marvel Comics and Visa have teamed up to create a comic focused on financial education. The first comic, Avengers: Saving the Day, was released in 2012 and is available in nine languages. More than 497,000 copies have been distributed worldwide. Canadians can read the comic online at www.practicalmoneyskills.ca/guardians. Educators can also access a teacher's guide to help build the comic into their lesson plans. Visa Inc. (NYSE: V) is a global payments technology company that connects consumers, businesses, financial institutions, and governments in more than 200 countries and territories to fast, secure and reliable electronic payments. We operate one of the world's most advanced processing networks -- VisaNet -- that is capable of handling more than 65,000 transaction messages a second, with fraud protection for consumers and assured payment for merchants. Visa is not a bank and does not issue cards, extend credit or set rates and fees for consumers. Visa's innovations, however, enable its financial institution customers to offer consumers more choices: pay now with debit, pay ahead of time with prepaid or pay later with credit products. For more information, visit visa.ca and @VisaNewsCA. Custom Solutions is Marvel's in-house creative agency that leverages all the greatest talent within Marvel Entertainment to create highly dynamic and compelling content and campaigns for global brands. Marvel Custom Solutions enables brands to make an emotional connection with Marvel consumers globally through the art of storytelling, and has the ability to deploy the work it creates through its robust print, digital, social and theatrical platforms, adding scale to the programs it creates. Toronto Public Library is the world's busiest urban public library system. Last year, we had 18 million visits to our branches and 31 million virtual visits. Torontonians borrowed 32 million items that they accessed in the library, at home or on a device. To learn more, visit tpl.ca or call Answerline at 416-393-7131. Toronto Raptor DeMarre Carroll speaks to students at Visa's launch of the new Marvel Comic book 'Guardians of the Galaxy: Rocket's Powerful Plan' at the Toronto Public Library's Sanderson branch.